Ending your marriage can be one of the most difficult decisions a person can make. Often, divorce can affect the most important aspects of your life, including your living situation, finances, your relationship with and access to your children, your assets, and your job. Additionally, people who are in the midst of a divorce are often highly emotional and experiencing perhaps one of the most stressful times in their lives. It is extremely important, therefore, to hire an attorney to make sure that your legal rights are protected and that your interests are well represented in any legal proceeding to which you may be a party. Because your lawyer is emotionally uninvolved with your situation, he or she will be able to act as your level-headed advocate as well as a buffer between you and the other party to your divorce. 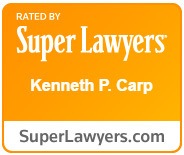 St. Charles attorney Kenneth Carp has over 20 years of experience practicing in family law and works tirelessly to obtain the best possible result for each client he represents. Call attorney Kenneth Carp at (636) 947-3600 to schedule a free consultation. Missouri courts have wide discretion in many matters that may arise in a divorce proceeding. It is highly advisable, therefore, for anyone going through a divorce in which there are issues regarding property or children to retain an attorney with experience practicing in Missouri family law. An attorney will be able to present your case in the best light possible, and may be able to significantly impact the outcome of your divorce. With over two decades of experience practicing in family law, attorney Kenneth Carp provides effective and seasoned legal counsel and representation. To schedule a free consultation with Mr. Carp, call our office today at (636) 947-3600.